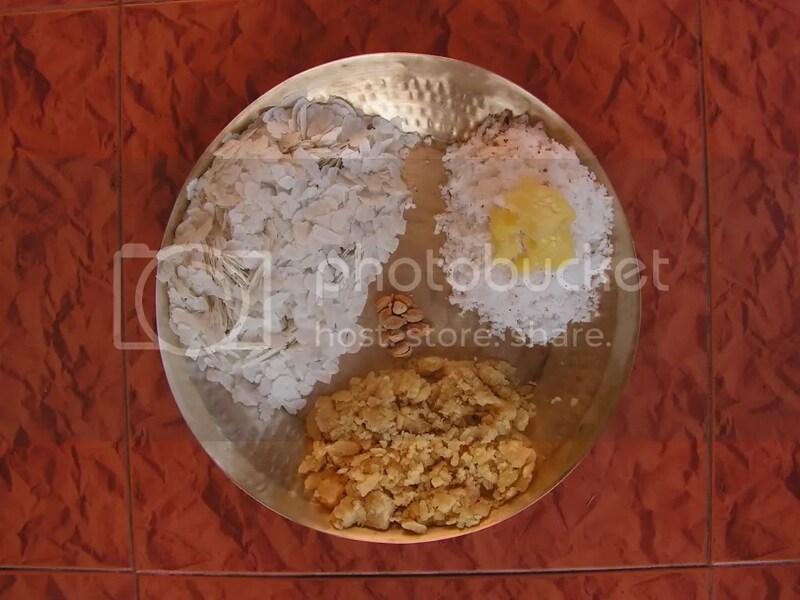 Panchakajaya is one of the main items of prasadam being offered to Lord Ganesh and also to Lord Krishna for Janmashtami. We prepare around 3-4 varieties and I have already put up Beaten rice pankajaya for Tulsi pooja, Bengalgram dal pankajaya, Hurikadle pankajaya and I would like to put up Greengram panchakajaya which falls in this category and is a tasty meal too. Here it is. 1. Wash and dry roast greengram in a skillet on low flame till you get a pleasant aroma and you notice the change in the colour to light greenish brown. 2. Roasted Greengram is as shown in the image below. 3. Chop jaggery, grate coconut and keep it aside. 4. On cooling run roasted Greengram in the mixer to remove the husk. Just blow the husk and powder it in the mixer to a medium fine consistency. Wash and dry roast sesame seeds till it splutters. Also powder peeled cardamom as well. 5. Mix both chopped jaggery and coconut well (using hands, if more convenient) so that it turns into a juicy mixture. Add a dollop of pure ghee to it. 6. To the above mix add ground greengram powder, cardamom powder and mix well. Finally add roasted sesame seeds to it and stir them well. Offer it to the almighty. 1. Always dry roast greengram on a low flame only. 2. Coconut used should be fresh. 3. Prepare this prasad about an hour earlier – since dry roasted greengram will soak and taste better. 4. One can adjust jaggery as per your taste. This entry was posted in Uncategorized and tagged Festival food, Panchakajjaya, Sweets. Hurikadle is the Dalia dal/Roasted Bengalgram dal. Also known by putani dali in konkani and pottu kalle in tamil. We use it almost all fried mixtures, in coconut chutney for extra flavour and is the main ingredient in the Masala dosa’s popular red garlic chutney. We also prepare Panchakajaya for Krishna janmashtami and Ganesh chathurthi. I put up 2 varieties of panchakajayas on this blog earlier. (See Bengal Gram Panchakajaya and Tulsi Pooja Panchakajaya ). However, this is a good prasadam for those who are just starting off and are looking something simple. Bengalgram dal panchakajaya and Hurikadale panchakajaya both are prasad items for Ganesh chathurthi at our place!!!!!! 1. Clean hurikadle to see if there is any dirt and keep aside. Grate dry copra and also peal cardamom. 3. Warm up sugar as well on the medium flame till it is crystalized a little and crispy. (make sure it never liquifies) Just transfer sugar to another bowl and just stir grated copra in the same warm bowl. 4. Wash, black sesame seeds and dry roast them in a broad based vessel on a medium flame till it sputters. Warmed up Dalia dal, sugar and dry roasted sesame seeds is as shown in the image below. 5. On cooling, dry grind dalia dal, sugar, cardamom in the mixer/blender one after the other . Transfer all the ground powder in a bowl . Add grated copra, roasted sesame seeds, and finally a dollop of pure ghee to it and Hurikadle panchakajaya is ready now. Offer it to the almighty. Bengalgram based prasad is the most popular in almost all temples in India especially in southern parts of the country. During Dussera festival on the occasion of 9 days of Navarathri, people prepare a prasadam consisting of Bengram usli, Dalia Dal and sugar mixed powder which we call Hurikadle panchakajaya (it is also roasted Bengalgram dal) and also the one which I am putting up now. 1. Dry roast Bengram Dal in a thick bottomed bowl on a medium flame till you get a pleasant aroma and keep it aside for cooling. Also add the cardamom to it so that it gets warmed and will be easy to peal. 2. Wash sesame seeds in water, drain it and dry roast the same till it pops completely but doesn’t get charred. Both the roasted dal and sesame seeds is as shown in the image below. 3. Peal cardamoms and powder it with roasted dal to a sujee consistency in the mixer and is as shown in the image below. 4. Grate coconut and add sugar to it and mix it with your hand in such a way that it is mixed properly. It is as shown in the image below. 5. Add Dal powder from step 3 to the coconut sugar mix and also add dry roasted sesame seeds from step 2 to it and mix well. Finally just add pure ghee to it just before serving. The Panchakajaya is ready to offer it to the almighty ! This entry was posted in Uncategorized and tagged 30 minutes, Festival food, Konkani dishes, Panchakajjaya, Sweets. Tulsi is supposed to be very sacred for Hindus. At most of Hindu households people worship the Tulsi plant. It is placed in the eastern side of the house as per Vastu and people worship daily by watering and placing flowers and applying Haldi and kumkum . A diya is lit evey evening after sunset. 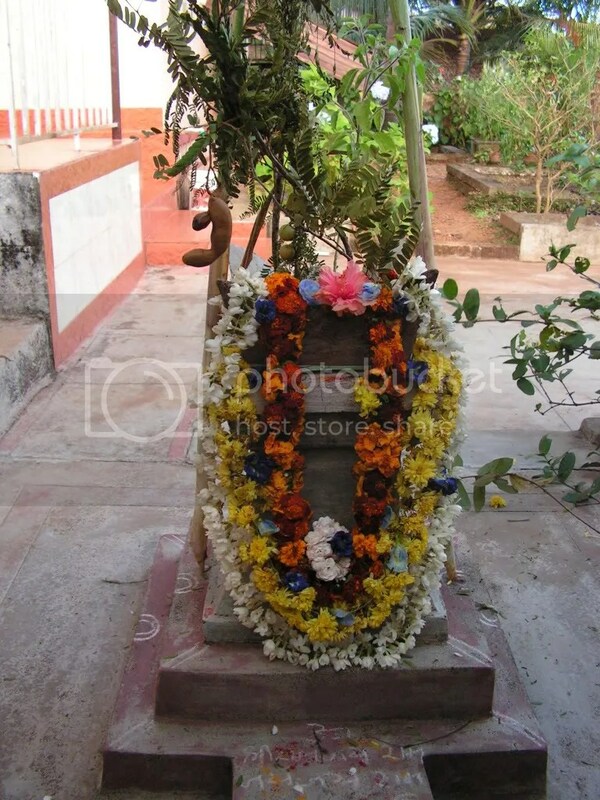 14 days from Deepavali is Uthar Dwadashi which is celebrated as Tulasi Pooja. It is called the Diwali month/Karthik maas. People celebrate it any day through out this month here in South Kanara district. Tulsi (holy basil) is Vishnu’s wife. No pooja among the Hindus is complete without offering tulsi to the lord. On this day we celebrate the pooja after sunset by planting a Tamarind and Aamla branch with the Tulsi . Sugarcane is also used for decoration with flowers and lamps made of clay lit around the Tulsi. The priest arrives and celebrates the wedding of Tulsi with Vishnu in the form of Saligrama . 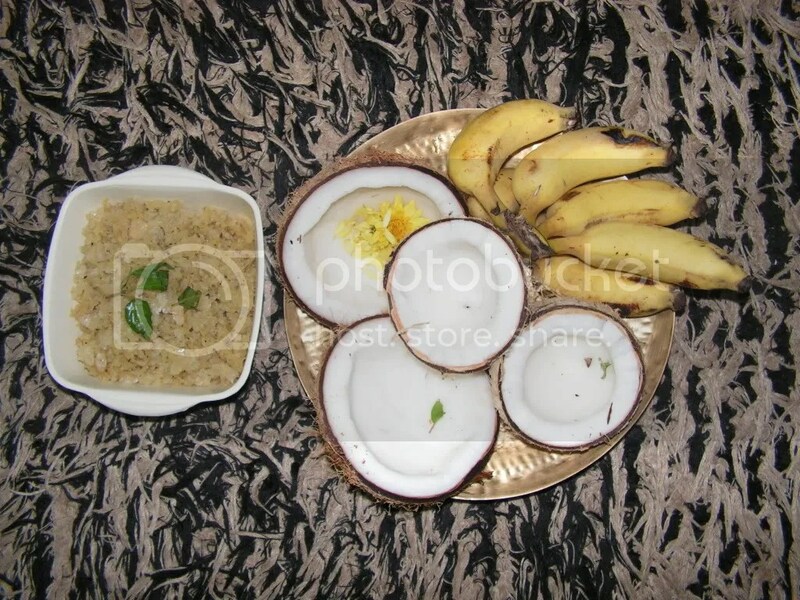 We offer coconuts, Banana and also prasaadam (in this case sweetened Beaten rice). It is called Panchakajjhaya. Pancha is five in konkani i.e. five ingredients to prepare the prasad. The recipe of panchakajhaya is here under and easy to prepare. Also called the Goad Povu (Sweet Poha) in konkani which means sweetened beaten rice. This is the prasad item for Gowri festival!!!!!! 1. Clean and sieve Beaten rice to see if there is any powder or dirt in it. 2. Crush Mollasses and grate coconut and keep it aside. 3. Place a skillet on the flame and just dry roast sesame seeds in it till it sputters. 4. Place a wide bottomed vessel on the gas and add 2 teaspoons of ghee to it. On melting add jaggery along with 2 teaspoons of water. 4. When jaggery melts in, add grated coconut to it and stir for around 10 minutes on a low flame until a homogeneous mixture is formed. 5. Allow the mixture to cool. In the meantime, powder cardamom and keep aside. 6. When the mixture has cooled down add cleaned beaten rice to it and mix. (Mixing with your hand can help the mixture become more homogeneous. 7. Add the cardamom powder to it. Also add roasted sesame seeds to it. Note: This dish should be soft to eat. Water which is added to the mollasses should be completely evaporated and should be like sweetened coconut. Don’t add water to this dish or to the poha. It will loose the originality of the dish. This entry was posted in Uncategorized and tagged 45 minutes, Festival food, Panchakajjaya, Sweets.